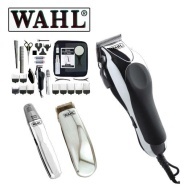 alaTest ha raccolto ed analizzato 39 recensioni su Wahl 79524-800 Chrome PRO. La media della valutazione per questo prodotto è 4.5/5, confrontata con la media della valutazione di 4.3/5 per altri prodotti. Abbiamo analizzato differenti valutazioni di esperti ed utenti, età del prodotto ed altri elementi. A confronto con altri prodotti, Wahl 79524-800 Chrome PRO ha ottenuto un alaScore™ complessivo di 86/100 = qualità Molto buono. Powerful little fan that looks very cool in gold, however it's very noisy so I can't have it on while I sleep. Wahl has gone plastic!! !Absolutely poor quality! Although item said it was chrome almost all of it was plastic! The combs and other accessories were also cheap poor quality plastic. Overall a very poorly made item, totally dissatisfied with it especially at the high price. I wouldnt pay £10 for it! Bought this for sons/husband using boosted Clubcard points so cost me about 79p! They are all very happy with it, it is in regular use and hopefully so for some time to come! Recommended! An excellent piece of kit. I am so pleased with these clippers after owning and using clippers personally for a good number of years these are by far the best I have owned. does exactly what it says on the box! Used it for the last month. It cuts and trims hair well, easy and light to use. 4 more times and it's paid for itself. Well pleased.